CATALOGUE WITH COMPANY PRODUCTION AND PRICES IN LITAS (LT.) IS IN THE RIGHT SIDE OF WEBSITE. PLEASE PRESS ON - Booklet . WHO WE ARE? Joint-Stock Company "ARDETAS" was founded in 1999. Currently it is one of the largest and most successful manufacturers of connectors in Lithuania. The company takes into account changing customer needs and constantly expands its range of production. We care about every our customer and therefore strive to offer not only excellent value for money, but also quick and easy delivery in Lithuania. The company is constantly expanding into new markets. Therefore, part of its production is exported to Denmark, Norway, Germany, England, Poland, Latvia, Estonia, Belarus and other European countries. MANUFACTURING PROCESS. In the way of cold forming connectors are made only from certified steel, which is coated with a zinc layer. This produces excellent protection against corrosion. Our manufacturing facilities occupy over 3000 square meters. The factory has 25 mechanical and automatic stamping presses (from 6 tons to 100 tons capacity). PRODUCTS. 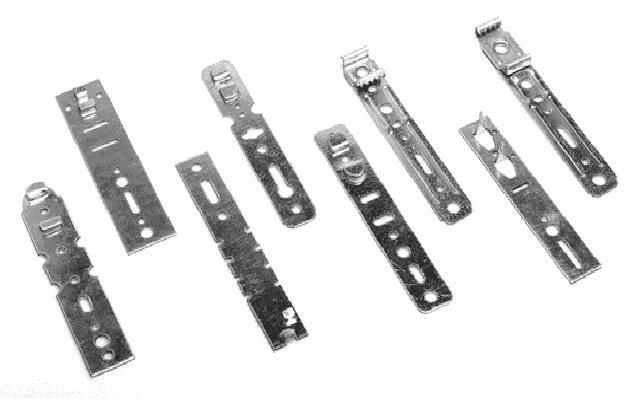 At the moment we can offer various sizes of mounting angles, purlin ties, joist hangers, mounting plates, profile connector CD-12 CD-14 as well as wood, aluminum, plastic window mounting plates and other metal products, which can be found in our catalog. Our excellent technical capabilities and many years of experience allow us to produce products according to individual needs. Our experienced metal specialists will be happy to answer all your questions and offer the best technical solution. QUALITY. The company regularly holds employee training. It also annually invests into the development of production and product quality. Due to the growing customer needs and in order to maintain the high quality of products this year we acquired a powerful steel slitting line. This will increase productivity and will allow us to offer our customers the most necessary products at an attractive price. VISION. Our future plans are not only to remain one of the leading connectors manufacturing company, but also in the run of the next three years, to increase our turnover by several times. In order to achieve the objectives the equipment will be updated, modern equipment will be purchased and the customers will be offered new products.